VR, also called virtual reality, so far, has gone through three booms. The VR technical principles were established in 1960s; the second took place in 1990s, the VR tried to commercialize but failed; now the VR is undergoing a third major change in pre-period. Marking by the event that the Oculus has been acquired by Facebook with 2 billion dollars, the VR commercialization and popularization in the global world is gaining steam. Currently, a lot of VR virtual devices have appeared in the markets, and these devices are mainly applied to game field. VR Headset Devices (“blinder”) fall into tree main categories: glasses, helmets and all-in-one PCs. The slip ring application mainly concentrates on somatosensory equipment. These equipments include whole-body Motion Recognition, Human Universal Load Carrier, Force Feedback input equipment, Gesture Recognition, Eye Recognition, and so on. All of these equipments usually need to employ the slip rings or rotary union. 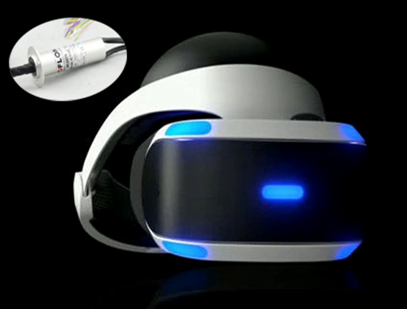 The picture below shows that the moflon slip rings are applying to a rotary VR helmet. When senior management at MOFLON Company has realized the great opportunity for the slip ring industry, hence, they devote themselves to develop and test the specialized slip rings for VR series equipments. Finally a series of slip rings for VR equipments have been realized, which has filled the gap for MOFLON Company in this field.